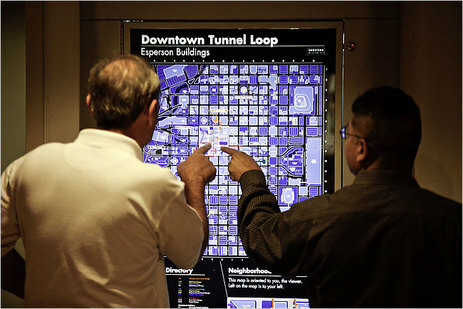 "The three major sections of the tunnel system are connected under the building at 919 Milam Street in downtown Houston." Source of caption and photo: online version of the NYT article cited below. The tunnels of Houston appear to be another great example of what Hayek called "spontaneous order." (p. A14) HOUSTON, Aug. 20 — Where is everybody? But below, there are tunnels at the end of the light — nearly seven color-coded miles of them connecting 77 buildings — aswarm with Houstonians lunching, shopping and power-walking in dry, air-chilled comfort. Few claim mastery of the labyrinth. “It’s one of Houston’s best-kept secrets,” said Sandra Lord, widely known as the Tunnel Lady, a Yankee transplant who dispels the mysteries for $10 a head and roams the downtown underworld with proprietary aplomb, sometimes stopping strangers to ask, “And you are?” Corporations pay Ms. Lord to orient new employees below ground, and nearly 45,000 natives and visitors have taken her Discover Houston Tours since 1988. 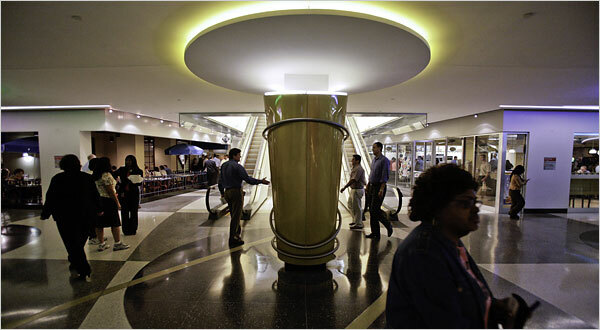 Ms. Lord, a writer and Houston historian, traced the origins of the tunnels to Ross Sterling, an oilman and governor during the Depression, who, inspired by Rockefeller Center, linked two of his downtown buildings underground in the early 1930s. 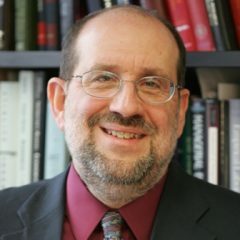 Soon after, an entertainment entrepreneur, Will Horwitz, connected three of his vaudeville and movie theaters to save on air-conditioning. And the tunnels grew from there, despite the private expense of digging connections. The oil bust of the 1980s forced many building owners to compete for business with amenities like tunnels. Many were flooded by Tropical Storm Allison in 2001, prompting installation of submarine-type doors with inflatable rubber insulation for airtight seals. RALPH BLUMENTHAL. "It’s Lonesome in This Old Town, Until You Go Underground." The New York Times (Tues., August 21, 2007): A14. 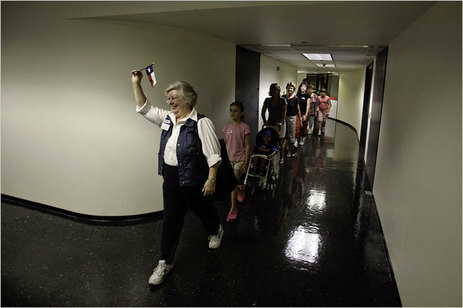 Top photo shows "Sandra Lord, owner of Discover Houston Tours, leading a tunnel excursion . . . " Bottom photo shows a map of the tunnels. Source of caption and photo: online version of the NYT article cited above.